I understand that in order to apply for a pasport in Victoria BC you need to line up an hour before the office opens just to be able secure an appointment. If your are too late to get an appointment for that day you have to come back another day. We have to travel from outside Victoria so it will take a day in travel time and even then there is no guarantee that we will even obtain an appointment. I now reget my decision to travel to my son's wedding outside of Canada. You can get your passport within 48 hrs if you pay some extra "fee" and if you can prove that you are traveling on a certain time, IE, you have a plane ticket. No you cannot always. I just went through hell today after traveling all the way to Ottawa trying to expedite mine. And yes, I had my plane ticket, and the cash to pay for the expedited passport. I got an agent in a pissy mood and was refused to expedite it for my trouble. NOT because I don't have upcoming travel either. But because this "agent" was in a bad mood. Well, it seems that getting a passport photo approved these days seems to be the quest of the century! Do passport officers have personal quotas of rejected photos they need to fill every day? Of my many family members who have applied for passports each and every one has had rejected photos! If they need to be so perfect then don't allow just any sixteen-year-old high school student who just got hired at the local drug store to be able to take that little Polariod and begin the process of ruining the perfectly good application process. It would save everyone alot of grief and wasted time and patience. Thank-you! My passport photo has been rejected 3 times for the following reasons: front of mouth slightly open, head too small, light reflecting off of hair, forehead too shiny and shadows behind ears. Three other people I know, that are Americans, had no trouble at all with their passport pics. I've been trying to get my application approved for over a month. Now my passport photo was actually approved, but my application wasn't approved because my guarantor wasn't present when I copied my greencard and ID. I need my passport to fly home for Christmas, and this is taking way too long. The people working at the Passport Office in Mississauga, Ontario have absolutely no sense of 'customer service'. The government IS a business - we pay for their services through taxes - yet I am spoken to as if I am recieving the services for free! My case was a bit complicated and I was requesting urgent pick-up, and the employee was telling me about how much work I was putting them through and that I'm lucky they're even considering processing it. I'm not sure if they are on a 'power trip' or if the complaints process is so difficult that the unsatisfied citizens do not even bother to complain (like myself). My husband and I went to get our children their passports. Went through the process made it to the second room, but when we got up to the desk we were told that because we were not married before we had our children we need their "long forms" (which let me add are $35 a piece). If we were married prior to having our children we would not need them. DISCRIMINATION!!!!!!!! !NO WAYS AROUND IT. We took the time to call our MPP which directed us to our MP, who of course was not in the office. We spoke with a couple of people there who were very rude! One telling us that being married before having children is showing responsibility!! I'm being honest here no joke! He also began to yell at my husband at which point my husband reminded him of his position, he in turn told my husband he can say whatever he pleases. I have recently received the "long forms" and to my surprise its the Live Birth statement we filled out after our sons were born, its a photocopy!! I paid someone $70 to bring up my filled out forms, print them and send them..unbelievable! Talk about organized crime...just look at our government!! I did all my due diligence, reading the passport application forms carefully, many times. It says that you can send a copy of your birth certificate (both sides) if your guarantor signs it. I did everything that was asked and sent it off to Quebec because we don't have a passport office in our town. I got it back from Quebec with a different instruction sheet that says you can't send a copy, you have to send the original. My mother sent her original birth certificate and got a notification back that you can't send your original bc with your application. Another case of the left hand not knowing what the right hand is doing! When I went into the officed to see about changing my name on my passport because I just got married. Not only do I have to pay full price for a new passport when I still have 3 years before it expires, the ignorant lady told me that I shouldn't have gotten married and changed my name. My dog literally ate my passport, and I have the shreds to prove it. I understand that it is a "legal" document but I think there should be some kind of replacement fee available when you passport becomes damaged if you bring it in. I just got my passport renewed less than 6 months ago, and now I have to pay the full price to get a new one. In some sense a passport should be provided by the government when you reach a certain age, just like a birth certificate is provided by them when we are born. Making us pay for proof that we are who we say we are is almost absurd. If we go through the hassle of getting the documents and signatures and dotting our i's and crossing our t's, they should be able to give us a break on the fees. Maybe a tax break or something. I am flying to Asia shortly and realized that my 24 page passport is almost full, so I was a little nervous about having enough space for their full-page Visas and stamps and whatnot. Apparently, Canada no longer allows extra pages to be added to a passport, you have to apply for a new passport and pay the full fee again. On top of that, I don't trust Passport Canada to get my passport processed in enough time, so if I want next day service, I need to add an extra $70 to the processing fee. All in all, it will cost me about $160 to get a new passport to replace the used up one I currently have which doesn't expire for another 3 years! There happens to be a photwest shop at the basement of 433 main st. winnipeg, in the passport building. The lady sitting in this office has no sense of customer service, she is not only extremely rude but she is demanding extra 5 dollars for cutting the photo to proper size. On demanding any phone no. or any business card that she is in, she not only refused but was looking furious. I do not know who has hired her or what kind business outcome employer is looking for.This type of employees not only ruin the established business but are capable of ruining the day of customer they come in contact with. I hope passport office help in removing this business from there so that they cannot take last minute photo takers for ride. This is just a rip off and passport should take notice of it. Most of you are blazing idiots. Who should have to foot the bill if you choose to change your name, fill your passport or allow your dog to chew it? Freaking morons. That's your problem. 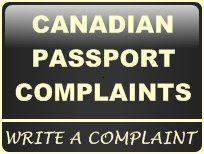 Passport Canada is not funded by tax dollars so mention of poor service for your tax dollars is wrong. It is funded by the previously mentioned morons. Additionally, there is no tax charged on any passport services. How's that for a tax break. For the dumb dumb with the ficticious story about sending a photo copy of the birth certificate, you are truly the biggest moron that's commented. Can you even truly read? Lastly, you do pay for any gov document proving who you are. Birth certificates are never free. Think before you speak, or atleast have half a clue before making an ignorant point. A fine example of the attitude you will get when speaking to an agent of passport Canada. My daughter was refused a flight from Australia to Bali because her passport was about to expire in 6 months less 4 days. For 4 days, she has had to catch a flight to Sydney to the Canadian Embassy, hotel fees, etc... to get another passport...which they told her will take 3-5 days to get...and, she still needs to supply references, birth certificate, etc...even though her passport is still good for almost another 6 months!! She was going to stay 3 weeks in bali. Which would leave her more than 5 months left on her passport????? That's the requirement from Indonesia... not Canada or Australia. 6 months... Of course it's stupid. Why don't you publish phone numbers for local passport offices? Your 1800 number is really frustrating to navigate through!!!!! Rather than have the cities and or towns in paragraph form, I would recommend they be put in COLUMM format. passports should be good for 10 years,like the usa and reduce the cost. Application submitted at local passport office, verified and given thumbs-up by the staff there, then rejected by issuing office on small guarantor detail. The staff at the passport office should have caught this before taking money and saying everything okay!! A good point: passports are 'good' for 5 years, yet you cannot ravel anywhere outside of Canada if your passport is within 6 months of its expiration date. IT is really only a 4.5 year passport. And it is too damn expensive. I agree: make it good for 10 years. And their criteria for photos is absurd. I have had to contact the ombudsman the last two times I applied for a new passport because my photos were rejected for several reasons. Sometimes they were 'valid' reasons. But in each case the second last set of photos I submitted were completely fine as was declared by the ombudsman. There is MUCH TOO MUCH SUBJECTIVITY amongst the staff who review the photos. And as soon as the staff see you are applying from outside of Canada, there is an obvious NEGATIVE BIAS against your passport photos. The forms do not have enough information on them. For example, no where does it say you need to bring your actual birth certificate or what type of clothes you can or can't wear in you photo. It took me 3 trips to jump thru these BS hoops. On Dec 24 2010 went to the passport office in Red Deer to file for new passport. They reviewed my passport app. and told me that it would take at least 6 weeks to have my passport processed, as I needed to have it sooner for a business trip I was told by the Red Deer passport office that I could go to Calgary Passport office which was open til 8:30pm, they handed me a brochure which gave me the location of the all the Calgary Passport offices and pointed to the one passport office that was open late. On Jan 3 2011 I went to work, left work early in order to get to the Calgary South office in plenty of time (I was planning to arrive at approx. 5:00 PM). I was delayed in traffic on Deerfoot trail and did not arrive at the door of the passport office until 5:28 PM. At that time I realized that the door was locked. There were people inside the office both being served and waiting their turn. I spotted the security guard looking at me from across the room and tried to get his attention to come to the door. He ignored my gesture and quickly looked away as if he hadn't seen me. A few seconds later he had to come open the door to let some people out of the office, he was so quick in his attempt to close the door before communicating with me that he almost closed it on the person that he was letting out.I had to stick my foot in the door before he would even acknowledge my presence, he was trying to close the door in my face before letting me speak to him. Once my foot eas in the door, I asked him as politely as I could why the door was locked. He said to go away, the office was closed for the day, still trying to close the door. I kept my foot in the way and asked him for a moment to explain that I had been told that the office was open until 8:30. He told me to call my MP and repeated that they were closed and to come back tomorrow, still trying to close the door. I explained that I had come a long way and only need a few moments of the teller's time as my passport had already been reviewed by the immigration office in Red Deer and all I needed to do was drop it off, There were still a few people being served and surely one more quick client could be forgiven under the circumstances, I even showed him the brochure that read that the office was supposed to be open until 8:30.He pointed to a very small typed note on the door that read starting on Jan 3rd the office will close daily at 5:30. He repeated that there no way I was getting in and if I didn't like it I should write a complaint to my MP. At that point I apologized for wasting his precious time and took my foot out of the door. He promptly closed it and walked away. It was precisely 5:32 at this point. I got a room at a nearby hotel and after an early breakfast and a $150. hotel bill for my wife and I, I returned to the passport office and it took 45 seconds to complete my business with the teller. I also missed 1/2 a days work in the morning because I had to drive back in the morning rather than the night before as planned. My complaint is that if office hours are being changed, the other offices should be notified as they send clients to these offices for services from other cities. also the security guard did not have to be so rude to me. I was very polite to him the whole time that we talked. It was the very first day of the changed office hours and letting one client in under these circumstances should not have been considered so unreasonable. One question.......why is a last name change so difficult when you get married when it can be so simple? !Why does it have to be a whole new application as though I've never had one before? Typical Government crap and money grab. Sorry, that was 2 questions. My passport smelled like poop. I sent my papers in nearly four weeks ago, completely filled out. On one of the forms it asked when I need my passport by, and I wrote March 10, 2012. I was told it would be about four weeks to get my passport delivered to my house, which would mean it would arrive on the nineth. I just found out today that I didn't have my declaration filled out by the right person and so I just received a letter today from Passport Canada saying that. They also told me that once I have the form properly filled out, it will take another 20 business days to get my passport. I'm supposed to leave in five days. It shouldn't take this long, especially when I only have to make a correction on one form. This is unbelievable and inconvenient. Now I can't visit my family who lives in the States. This is just awesome (sarcasm intended). I am tired of people coming in and asking where the Passport office is. I sent my passport for renewal a month ago, in perfect condition, via Xpress Post because I did not have time to line up at the Passport Office. This was on March 7th and according to Canada Post, it was received and signed for on March 9th. Passport Canada CHARGED by credit card on March 13th. Well, on March 22nd, I receive an envelop from Passport Canada stating that they rejected my passport NOT with a letter, like they say they do but with FORMS with a bunch of RED on it. It stated they rejected my passport because it was damaged. To my HUGE surprise, because I sent it in in perfect condition as I usually have a cover for it, I called. The agent (extremelly rude) apparently stated that the cover was apparently DETACHED from the rest of the passport. I said that it was impossible as first of all, the cover on those things is quite thick and other, I have protector for it and the cover was not even bend when I sent it in. I told her that I had travelled in September 2011 in Europe with absdolutely NO ISSUES with the state of my passport. Why, between then and now would it have been detached???? Well, they treated me on the phone like I was a criminal, a liar and I HAVE TO RESUBMIT A NEW PASSPORT APPLICATION WITH MY BIRTH CERTIFICATE - because of THEIR ERROR. They CHARGED MY CREDIT BEFORE TELLING ME ABOUT THIS. I told that it is insane that I was charged for the processing of my passport that has been denied on something that I did not cause and that because of that, I will not be sending in my Birth Certificate because I have no proof that they will NOT RUIN IT!!!! Passport Canada does NOT take care of your passport when you are submitting a renewal via mail AND their phone agents are THE RUDEST of all EMPLOYEES I have ever spoken with. Conveniently, their website has no where for anyone to file complaint about their service. They kept my second picture and I do not know where it went to and who has it. I do not know why I was charged when they did not process my passport. NO ONE IS ANSWERING ME AND NO ONE IS GIVING MY PASSPORT. THEY LIE AND COVER THEIR ERRORS AND LIES. Where do I make a full complaint. The agent I dealt with today after traveling all the way to Ottawa to expedite my passport was rude. Made personally hurtful and snotty remarks to me and then totally screwed up my passport application by having me write on it in a section I should not have. Now I will have issues getting it and I NEED it expedited. The office in Ottawa needs to talk to their agents. This man was WAY out of line. I was just at the passport office in Montreal, the man there was extremely rude to me. My passport is only 6months old, yet the photo is a bit scratched and there are scuff marks on it, so obviously I need to replace it, I understand that as I travelled to London England and the border control gave me a hard time. I submitted all required forums and everything was filled out proper. It is damaged not lost, so I filled out a required declaration for lost passports. In the explanation I wrote "Passport damaged, due to storage in suitcase,scratched and need replacement" I included the origional passport and the agent verified all my ID, I was born in Canada. He then was extremely rude and nasty to me FOR NO REASON and I mean that, I was very nice and he went out of his way to be rude to me. He tried to accuse me of "scratching it off purposely???" WTF and he insinuatd I am commiting fraud or something??? Is this for real WHERE DO WE COMPLAIN,, I DEMAND TO KNOW!! Piece of trash. Does anyone know if you can still send your passport application online and finalize the application in person? I'm sure I did this 5 years ago, so I didn't have to wait in a room like cattle for hours. Now I cannot find any information about this on the passport website. Tried calling too.. but we know how that toll free line works - busy busy busy and never get through! Thank you. I'm writing to answer my own question about applying online for a passport. I asked them and they no longer offer this service. It was good for us but not for them. Go figure. Why is it we cannot talk to a human being anymore? All I have is two or three quick questions, yet I cannot locate the phone number for the office nearest to us, NORE can I get a HUMAN on the phone over the toll free line. Instead I have to sit there, pushing buttons, listening to an annoying voice ramble on about things I already know......WHY IS IT IMPOSSIBLE TO SPEAK TO AN ACTUAL HUMAN ANYMORE?! Why can we not find phone listings for our local offices?! BTW the nearest office for us is 2 HOURS away so just driving over is NOT an option!!! Why do northern BC residents have to travel all the way to Vancouver, or Kelowna to obtain a passport quickly? Why not put a Canadian Passport Office in Prince George (capital of the north) It costs on average over $1000 in travel and accommodations to renew or apply in person to receive an urgent/ express passport. Why do northern residents always lose out? We should have equal rights as BC residents to have the conveniences the southern part of the province have. There is definitely something wrong with our Passport system when a Canadian born and raised, without a criminal record cannot easily obtain a passport! The process is time consuming, very inconvenient and the there is a definite abuse of power expressed by the 'lovely' the reps who seem to be glaringly judgmental, rude and offer nothing, not even a smile. Way to go Government of Canada, you employ very successfully! Office in Victoria, BC has at least 10 agent windows but only 2 agents working, and with a packed waiting area. Surely more staff could be hired when a 10 year passport is $160 now. There are no numbers provided for local offices. As I am from a rural community with no roads to my community I must fly from 80 miles above the Arctic Circle to lower Yukon T. in order to complete passport requirements. The logistics, time, and money are what I personally invest, it would be nice to be met half way by a local operators whom could speed up this process as I work 9-5pm further complicating matters. A little conversation would go a long way opposed to being coordinated like bulls to the slaughter house against the rails of robotic phone keytone interactions. Website blurbs and pre-recorded phone messages are not a wholesome way to obtain information, it's more like searching for something respectable to wear in a salvation army bin with a lunch-time hour time limit. You have NO OFFICE IN THE YUKON?! OR NWT?! I just let down a network of funders and officials from across North America who tried to hire me for keynote speeches and important panel discussion which would inform and facilitate the process for millions of dollars being released to different organizations across the Arctic from Alaska to NWT because THERE ARE NO PASSPORT OFFICES IN THE TERRITORIES?! I am beyond disappointed that the entire north must now suffer the consequences of the situation I have found myself in, all because you don't feel that the entirety of northern Canada is deserving of an office in which to properly obtain a document which you require us to have in our international dealings and travel. I will make your lack of service known from our Premier of the Yukon Territory to your upper management. I have a 10 yr passport which Is one yr old. Coming back into Canada my picture page was folded over when it was scanned by the customs person showing me how to work the new system. It now has a permanent crease in the bottom left corner an inch in on the diagional. It was rejected and she looked as saw she foulded the corner. She straightened the page and rescanned it and it worked. So it looks like it is accepted in Canada but what happens if I try to enter a different country such as Cuba where they slide the passport through a groove to read it. If Cuba rejects it then what. If I need a new passport will I get it without paying for itt as it was a Canada customs person who damaged it. Does anyone have an answer. Tks Murray.